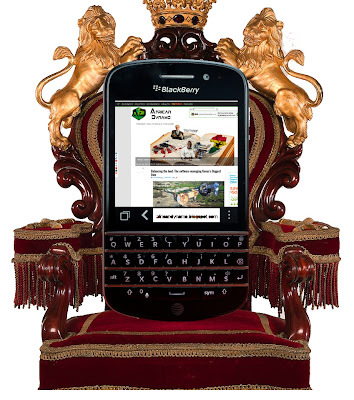 In Africa, Blackberry has become the most popular smartphone in a booming market. While Blackberry’s stock may have dropped as low as $6.22 a share in America, its position in Africa has only gotten stronger in the last few years. In Nigeria for instance, Blackberry owns 40% of the smartphone market, and the figure is 70% in South Africa. Their strategy in Africa has been to partner with regional carriers, offering unlimited data plans for a flat rate, along with access to Blackberry’s push email and messaging services. Cheap blackberries can also be found online, where a booming used-phone market offers African buyers a low cost-of-entry to the brand. The blackberry platform itself has an architecture that is particularly effective in emerging markets; it offers efficient use of data networks, as well as fast access to dependable messaging services that can operate independent of African nation’s sometimes spotty network infrastructure. This combination of network efficiency and dependability has allowed Blackberry to dominate the smartphone market, essentially functioning as the primary access point for mobile internet and communications, in a region where many individual's sole access to the internet is through a mobile browser. Recent moves by the company indicate that, despite (or perhaps due to) its financial difficulties, it intends to continue taking advantage of the opportunities in these markets. With recent product introductions like the Blackberry 9720, Blackberry has directly targeted customers who prefer its mature operating system and hardware and want to upgrade their phones while maintaining these features. The company has also expanded its footprint in the region, recently announcing its first official blackberry-branded retail store in Lagos Nigeria. It seems Blackberry is betting big on Africa. It would seem that, for Africa, the age of the smartphone has also arrived. Do you use a Blackberry? Feel free to brag in the comments below.